Sometimes there is nothing that hits the spot better than a classic grilled cheese. You probably already have your go-to recipe, but my Dill Pickle Grilled Cheese has just a couple of extra ingredients that will kick lunchtime up a notch! The vinegary pickles cut through the richness of the cheese, while the dill adds so much flavor. And you do not need to use fancy, expensive bread! The bread I have used in this recipe is just classic white country sandwich bread. I tested it with all kinds of artisan bread, whole wheat bread and even homemade bread but I really loved the simplicity of a childhood staple, like any simple white bread you ate growing up. For entertaining, you can serve this cut into small triangles as an hors d’oeuvre – people go crazy! Heat a panini press or a medium skillet over medium heat. Place the bread on a cutting board and lightly brush the top of each slice with butter (don’t forget the corners!). Turn the slices over and pile one slice with ½ of the cheese, dill pickle chips, the remaining ½ of the cheese, salt and pepper. 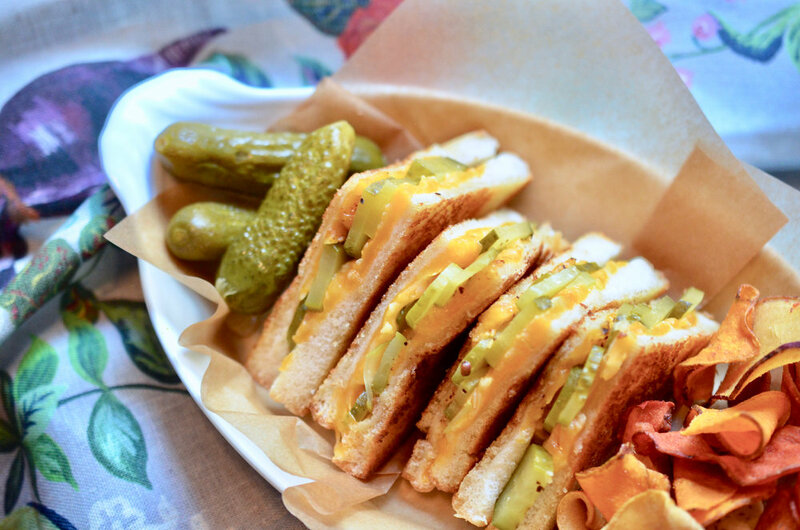 Place the remaining slice of bread on top of the cheese and pickles, buttered side up. Cook the sandwich on the panini press or in the pan for about 5 minutes total, flipping once if using a skillet, until nicely browned on the outside and melty and gooey on the inside. Transfer the sandwich to the cutting board and let rest for 1 minute. Serve hot!